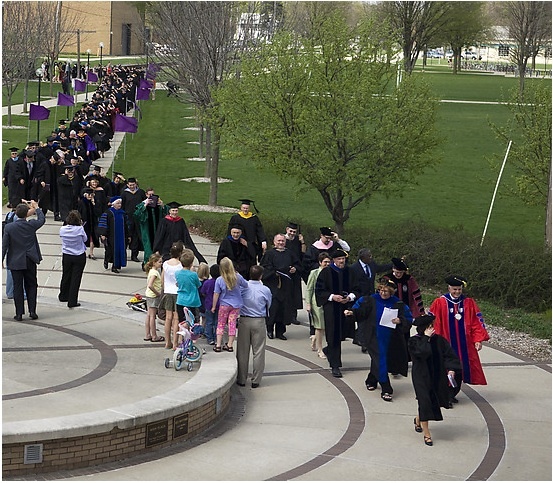 Faculty and students en route to graduation ceremonies at Goshen College's 111th commencement on Sunday, April 26. Goshen College’s Class of 2009 received degrees on Sunday, April 26, after being encouraged to take a leap of faith by President James E. Brenneman and to have courage and to persevere by Union College President Stephen Charles Ainlay, a 1973 Goshen College graduate. A highlight of this year’s commencement was the conferring of the college’s first master’s degrees. Three students – Mallory Kuhn of Spencerville, Ohio; Nayla Jiménez Cabezas of Cartago, Costa Rica; and Todd Weston of Lee’s Summit, Mo. – graduated with master’s of environmental education degrees. The program is based at Goshen’s Merry Lea Environmental Learning Center near Wolf Lake, Ind. The Class of 2009 consisted of 236 graduates – three of them candidates for master of arts degrees, 175 candidates for bachelor of arts degrees, 18 candidates for bachelor of science degrees and 40 candidates for bachelor of science in nursing degrees. At a morning baccalaureate worship service in the college’s Church-Chapel, President Brenneman encouraged graduates to take a leap of faith with the assurance of landing in the embrace of God. “I’ve found it to be true that God’s will for a person’s life is often, though not always, only known clearly and unambiguously in hindsight. Going forward, one’s life often appears, as the Apostle Paul says, ‘through a glass, darkly,’ like leaping into a dimly lit future,” Brenneman told the graduates, their parents, family members and friends, as well as college faculty and staff. Brenneman said the Bible provides many examples of people told by God to interrupt their lives and to immediately respond to God’s calling, such as when Jesus told his would-be disciples to leave behind everything and to follow him. Three hours later, at 3 p.m., 130 current and retired faculty members led 222 graduates in a joyful procession into the gymnasium of the Roman Gingerich Recreation-Fitness Center for the 111th Goshen College Commencement. A brass ensemble, directed by an associate professor of music, Gregg Thaller, greeted the procession. After an invocation and a congregational hymn, Brenneman introduced Dr. Stephen Charles Ainlay, who grew up in Goshen, earned a bachelor’s degree in sociology at Goshen College in 1973 and now is the president of Union College in Schenectady, N.Y. In his commencement address, “A Pilgrim’s Mind,” Ainlay told the graduates that he was transformed by his Goshen College education and that he wished the same for them. Ainlay based much of his address on “Mayflower,” a 2006 book by Nathaniel Philbrick about the Pilgrims, their voyage across the Atlantic in 1620, their settlement of Plymouth Colony and their changing relationship with native peoples. The Pilgrims’ 65-day voyage across the Atlantic Ocean was filled with hardships, including a rough passage, cramped and unhealthy quarters, seasickness, poor food and water and verbal abuse by the Mayflower’s crew. Still, they continued despite their many obstacles and eventually established a successful settlement in Plymouth. As such, they continue to offer important lessons on living, such as the importance of courage, perseverance and discernment. After Ainlay’s address, there was recognition of retiring faculty members: Fern Brunner, associate professor of nursing; Carl Helrich, professor of physics; Victor R. Koop, professor of psychology; Sally Jo Milne, associate librarian; Ronald J. Milne, professor of mathematics; and Judy Wenig-Horswell, associate professor of art. Together, they have provided 163 years of service to Goshen College. Special mention was made of Deanne Elizabeth Binde of Lake Park. Minn., who died in a traffic crash on May 22, 2008. She had been scheduled to graduate with this class. Taking part in commencement were two parents of graduating seniors: Dagne Assefa, the father of Lydie Assefa of Indianapolis, who offered the invocation, and Rachel Miller Jacobs, the mother of Ben Miller Jacobs of Goshen, who said the benediction. After the benediction, faculty and administrators lined the main corridor of the Recreation-Fitness Center and applauded the departing seniors. This tradition also takes place at the beginning of each academic year to welcome students back to campus. Represented in this year’s graduating class were students from 18 states, including 97 from Indiana, and from 13 countries. The class included 15 graduates with double majors. Thirty-six students graduated with highest honors – grade point averages of 3.9 to a perfect 4.0. In addition, 90 others were on track to achieve GPAs of 3.60 and above. This commencement was the third consecutive year, after a break of four decades, that the college has recognized such academic honors. The academic program with the largest number of graduating students was nursing, which held its traditional pinning ceremony the day before commencement to recognize the 40 individuals who completed degrees – 22 through the traditional, four-year program and 18 through the bachelor of science in nursing degree completion program. Other top majors in the class were organizational management (17), business (17) art (16), music (15) and social work (14).